This year there were no bees buzzing around the catalpa blossoms. I know because the hammock is hung on the lowest branch of the giant catalpa tree, and this year, the only hammock hazard was from falling catalpa blossoms. There was no potential problem of a bee sting, because there were no bees. In a beginning backyard fruit tree orchard, this is not good. In an effort to see if the bees have really disappeared, we stopped mowing the back yard and let the clover bloom. There actually seems to be more clover in the back yard than grass — perhaps a leftover from when clover was routinely sown between the older apple trees. Over a period of a week, we saw about ten honey bees in the clover (and five rabbits, ten deer, and a groundhog). 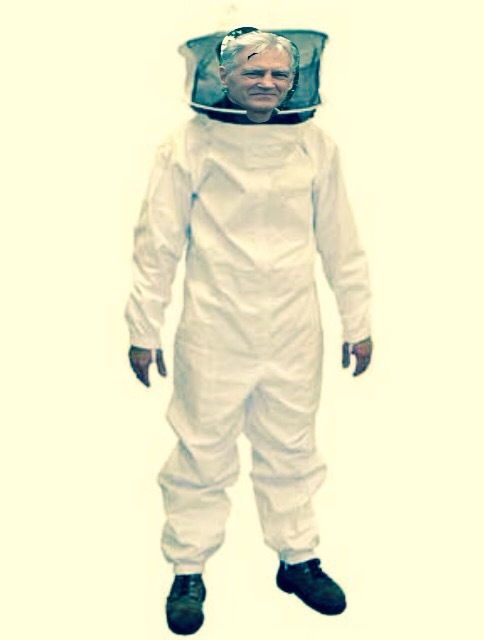 This has become such a worry that Mr. H.C. has actually suggested we buy a hive of bees for next spring. We’re thinking of buying the hive, the bees, and some supplies, and asking a friend to take care of it the first year, while he is mentoring us. This is quite a step for Mr. H.C. — he actively dislikes bees — though neither of us is allergic to their stings. It has become a national anxiety about bees. You can read about the issue here and here and here. No one will say exactly what the problem is, but to me, a non-scientific, tree-hugging, crunchy, suspicious-of-all-big-corporations type of person, it is obvious. Pesticides. Duh. If we spray to get rid of insects, we’re going to get rid of insects, yes? A full third of the American diet is dependent on pollination, and wild and domestic honeybees are responsible for 80 percent of pollination. About 200,000 species of plants rely on insects and a majority of those rely on bees. Commercial beekeepers are often feeding their bees on high fructose corn syrup, a questionable man-made sugar substance at best; a cancer-and-diabetes-and-obesity causing substance at worst. Not surprisingly perhaps, organic beekeepers have not experienced CCD, leading to speculation that overall greener management practices could be the answer even if direct causes are not determined. So come next spring, we may look like aliens ourselves. But we won’t be abducting bees; we’ll be helping to pollinate catalpa trees. ← 137. Critter Wars: they shoot groundhogs, don’t they? I, too, have thought of getting a hive, but wonder if the same thing that got the other bees will get mine. I suspect the liberal use of roundup on surrounding corn fields. So sad. Yes. And fences don’t work against it. We have only woods and pastures nearby, so we’re hopeful. And we have some months to educate ourselves. Oh dear, yes worrisome isn’t it. I don’t use any pesticides in our yard and had been enjoying the bumble bees in my rose bush which is finished blooming for now. I found a bee laying on top of my Cosmos, I could see what appeared to be breathing but it seemed to be very lethargic and not buzzing. I thought the same thing, “oh no! did you just come from a toxic yard little one?” I looked again this afternoon and didn’t see it, so I hope it buzzed off. A hive sounds awesome. Plus you might have fresh honey for either a market or baking too. I’ve been wondering if bumble bees would take over the pollination — honey bees are actually not native to the Americas — they came with the European settlers in the 1600s. So something must have pollinated the native crops! We have had similar concerns for years. Finally, after relocating we found ourselves in a position to take action. We walked our talk. Three hives. They’re doing very well. It’s a good thing that they know what they’re doing, because we’re still newbies. Sometimes, if your property is situated nicely (no nearby sprayed fields), local beekeepers will park their bees on your property. It’s a way of easing into the world of bees if it worries you. Yes, that’s what we are hoping to do. Talking this weekend with a local beekeeper. (Yikes!) I’ve been reading the catalogs — it all seems so complicated! And good for us, there aren’t any sprayed fields nearby — just woods and pastures. Did you buy three all at once? I bought two, and then a miscommunication with a friend I was helping resulted in my ordering another for him–even as he ordered his own. So I kept it, and we are proceeding with three. So far, though it’s only been since June 1, the bees are doing very well, and I am learning.